There are no large coronal holes on the sun today. Image credit: SOHO Extreme UV Telescope. AURORA MEGA-GALLERY: Have you ever wondered what it would be like to fly through the aurora borealis? Can you see auroras from Florida? Is there a season for geomagnetic storms? Answers await in the new Aurora Mega-Gallery. 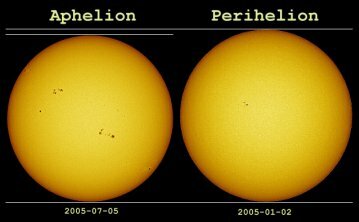 EARTH AT PERIHELION: Don't look, but the Sun is bigger than usual this week. That's because Earth is at perihelion. Earth's orbit is not a perfect circle, it is an ellipse. Our distance from the Sun therefore varies throughout the year. Perihelion is the least distance: 147 million km on Jan. 4th. For comparison, aphelion is the greatest distance: 152 million km on July 4th. The picture above, contributed by Anthony Ayiomamitis of Athens, Greece, shows how the apparent size of the sun varies throughout the year. He took the pictures on the dates of aphelion and perihelon 2005. One small problem: Just as Laurent was about to photograph the moon, "my camera's battery got cold and died," he says. "I had to heat it by putting it into my pants close to my skin. Such a photograph needs this kind of sacrifice." 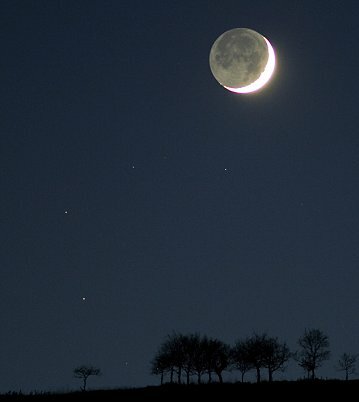 The moon is a crescent again tonight. Look for it in the western sky when the sun sets. And if you plan to take pictures, warm those batteries before you go outside. You are visitor number 33670590 since January 2000.